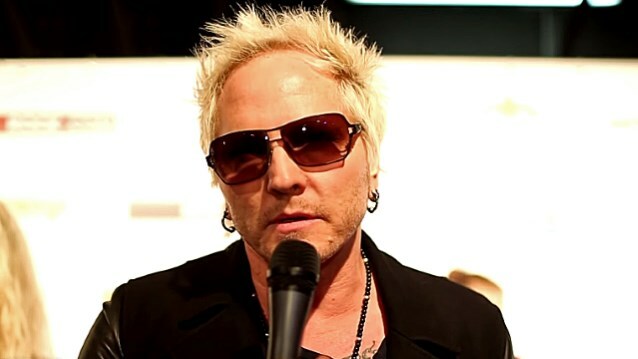 Ex-GUNS N' ROSES drummer Matt Sorum says that he isn't participating in the band's comeback shows because he wasn't asked to take part in the reunion of GN'R's classic lineup. Only singer Axl Rose, guitarist Slash and bassist Duff McKagan from GN'R's "Appetite For Destruction"-era lineup took part in this past weekend's Las Vegas shows and the April 1 surprise gig at the Troubadour in West Hollywood. They were joined by keyboardist Dizzy Reed, guitarist Richard Fortus and drummer Frank Ferrer. Also appearing with them was second keyboardist Melissa Reese. 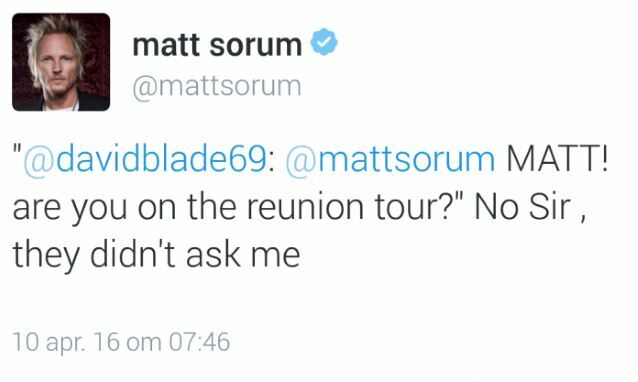 Asked by a fan on Twitter if he is going to perform with GN'R on the reunion tour, Sorum answered: "No Sir , they didn't ask me"
Adler last year spoke about how he would feel about a hypothetical reunion of the classic GN'R lineup which would include Matt Sorum on drums instead of him. "Matt wouldn't do it," Adler said. "I see Matt practically every Monday night, and we talked about it. He wouldn't do it unless I was a part of it. And I said, 'Well, dude, I would do it without you.' And he said, 'But you're the original guy. You're the sound of GN'R. I'm not. So it's different.' And I said, 'If I did it, if Axl wanted to play the '[Use Your] Illusion' songs, I would have you right next to me. You come up and I'll either take the throne or sit where I sit. '… Sort of like [the way we did it] at the Rock And Roll Hall Of Fame [induction in 2012]. They didn't show that part on TV, I don't think, but [Matt] played 'Brownstone', and then I came up and played 'Sweet Child' and 'Paradise City'." Sorum told The Pulse of Radio in a 2009 interview that if the classic GUNS N' ROSES band reunited, they should perform with both him and Adler. "If it's me on drums or Steven or whatever, if it happened, it'd be great, you know. I would actually say to them, 'Hey, bring both of us back,' you know. Let me play the other stuff. 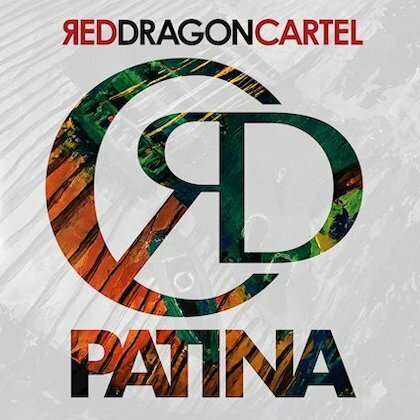 We'll have two drum kits. I don't care. If 'Appetite' ('For Destruction', the band's debut) sounds better with Steven playing it, have both guys up there. They can afford it." GUNS N' ROSES was inducted into the Rock And Roll Hall Of Fame in April 2012. Adler, Sorum, Slash and Duff McKagan attended the ceremony, while Rose and former guitarist Izzy Stradlin stayed home. GUNS N' ROSES are still scheduled to play two shows in Mexico City and two gigs at the Coachella Valley Music And Arts Festival starting next weekend. A full North American tour is on tap for this summer.